These sites have less traffic than Facebook, Twitter, Google+ and Youtube, for example, but the traffic is more targeted, increasing the chance that visitors will be interested in linking to your site. 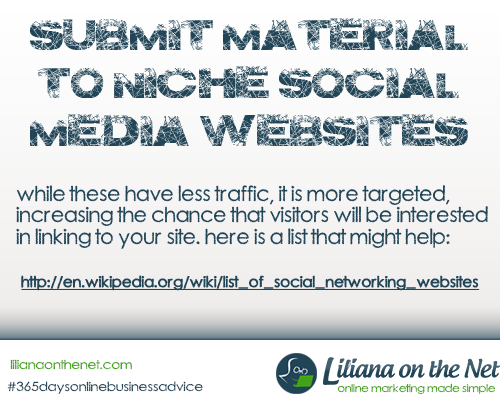 This is my 5th social media tip so the following are prior posts I’ve made on social media and still apply even if you decide to concentrate your efforts on niche websites. Like any part of your business you need to define your goal to create direction. For example if your goal is to have a social media presence, you probably decide to create a blog and a Facebook Page, for example, what do you need most? Traffic to both, therefore defined goals let you see the whole picture. 2. Gain the trust of your audience. Success will come if people trust you, don’t focus on profit, just focus on giving a good service and value and success will follow. Money follows success not the other way round. 3. Engage with your customers. I remember late 90s I worked in a company as the Financial Controller, it was a small company, where the “accountant” tends to do most functions such as financial, human resources, and adviser of the owner. I remembered suggesting that he should ring his top customers and find out how to improve his service to them. He was horrified at the idea, needless to say he never carried it out. Well we need to engage with our customers and the net provides us with an incredible opportunity with social media and surveys, why not combine the two? Yesterday I said I was finally reading the book that my mentor had advised we read. I will disclose the book on my 2 February post. As my application of this, I’ve offered to upload some websites for someone :). Are you talking about guest posting or something different? You are so right about using your time wisely, especially on social media. It’s addicting, at the same time a distraction. As long we’re aware of it, I don’t see any issue using it. After all it’s a great tool to have to engage with new clients and customers. Thanks for the great post! You are talking to the Queen of wasting time in FB during 2011 and 2012. Then I’ve realized what is the point with debating politics/current affairs when really nobody wants to debate but just argue. Even now though it is so easy to spend hours, even in business groups.